It is always important to remember one’s manners, whether eating at a restaurant or with family in their home. Here is a brief guide as to what to expect and how to behave when eating in Germany. 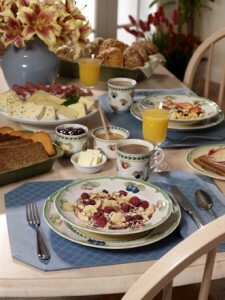 We will detail typical German foods for breakfast, lunch, dinner and snacks. We also include some general observations about how food is purchased, served and eaten in Germany! A typical breakfast in Germany starts off with a warm beverage such as coffee, tea or hot cocoa. Next follows bread (Brot) or bread rolls (Brötchen) with various spreads and toppings. These could include Butter (butter) or Margarine (margarine), Marmelade (jams/preserves) or Honig (honey). These are the “typical” spreads, although there are others too! Quark (a type of curd cheese), Wurst (sausage) and Käse (cheese) are also popular. A glass of juice (Saft) is also commonplace, as is a boiled egg (Ei). Cereals are also common, particularly among German youth! Müsli, which is a mixture of cereal flakes, nuts and dried fruit and other ingredients is also favored! It is mixed with Joghurt (yogurt) or Milch (milk), and is often topped with fresh fruit (Obst)! Müsli is not only delicious, but it is healthy too, making it a good alternative to sugary cereals! With today’s busy lifestyles there is a growing trend towards eating a more simple breakfast. What does this mean? You are more likely to see young people eating cereal rather than tucking into a more hearty meal of bread, cheese and sausage. 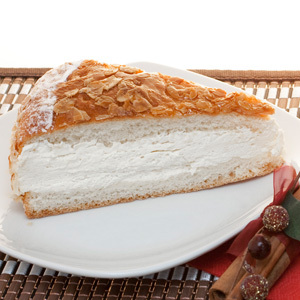 However, the traditional breakfast of fresh breads accompanied by cheese or meat is still alive and well. Particularly, this is common on the weekend when the family has more time. With a bakery (Bäckerei) on every street corner, it’s customary to buy freshly baked rolls on Saturday and Sunday. This bread is for the whole family to enjoy over a leisurely breakfast together! On weekends, some Germans also like to cook eggs. 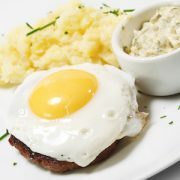 The most standard types are hartgekochtes Ei (hard-boiled egg), Spiegelei (fried egg) or Rührei (scrambled egg)! Germans have plenty of words to describe a meal that is eaten between main meals! Far from being unhealthy, eating small snacks between meals is actually encouraged to prevent overeating at lunch and dinner. Eating a snack between breakfast and lunch is very traditional in German schools. This tradition is called Pausenbrot or Zweites Frühstück. Translated literally, these two terms mean a “recess bread” or a “second breakfast.” A little known fact for Americans is that German schoolchildren generally don’t eat meals at school. This means that there is quite a long wait between breakfast and lunch, which they will eat at home! So, the Pausenbrot is meant to make sure students have the energy and ability to concentrate for the entire morning and practice their manners! 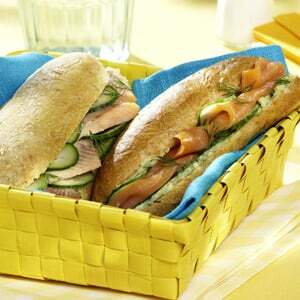 Although the word Pausenbrot indicates that it’s a sandwich snack, it doesn’t necessarily have to contain bread. Pausenbrot may be a small sandwich, but fruit is quite typical! Yogurt or a Müsli bar are also popular Pausenbrot snacks as they are transportable and healthy! Adults also need to keep their energy levels up during the day! For them, it’s the Zwischenmahlzeit (in-between meal) that keeps them going! A Zwischenmahlzeit is also referred to as Brotzeit, Vesper or Zweites Frühstück for adults. After all, snacks aren’t just for children! 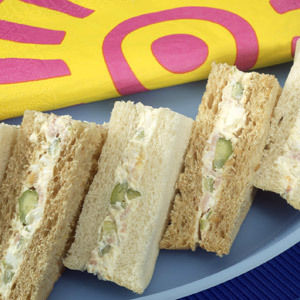 The English word “snack” is also used, as is Imbiss, although these refer more to actual meals that may replace main meals. However, the Zwischenmahlzeit is meant to be eaten in addition to the main meal to fill one up during work hours. Traditionally, German families eat their main meal during the day, between 12 and 2 p.m. However, many families now eat their hot meal in the evening. A typical lunch plate might consist of Kartoffelsalat mit Würstchen or Frikadellen. This is potato salad with sausage or meat balls for the first part. Next is Spätzle mit Geschnetzeltem (Spätzle noodles with stir-fry), Schnitzel mit Buttergemüse (Schnitzel with buttered vegetables) or Fischstäbchen mit Kartoffelpüree (Fish sticks with mashed potato). Meat is served most days, particularly pork and chicken. 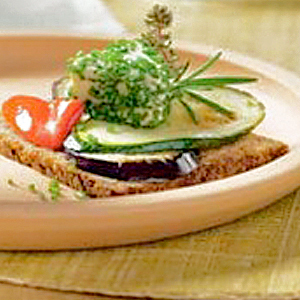 Vegetables are also a standard part of any Mittagessen despite common misconceptions! Typical vegetables served at lunchtime are grüne Bohnen (green beans), and Möhren (carrots). Additionally, Erbsen (peas) and Kohl (cabbage) are fan favorites. Potatoes are also a staple and come in the form of Salzkartoffel (boiled), Knödel (dumplings), Bratkartoffel (fried potatoes), Krokette (croquettes), Kartoffelpüree (mashed potatoes) and, of course, Pommes Frites (french fries)! Naturally, as popular as potatoes are, rice and noodles are also often eaten as side dishes! Abendbrot when literally translated means “evening bread”. It is a light meal that is usually eaten between 6 and 7 pm. This is because German families tend to eat their main meal during the day. A typical Abendessen consists of a selection of whole grain bread, cheeses, deli meats and sausages, and mustards and pickles (gherkins are very popular). The evening meal is accompanied by a salad and/or soup, depending on the season. A glass of sparkling mineral water (Mineralwasser) or a glass of juice (Saft) is usually the beverage of choice for young people. For adults, a pint of beer or a glass of wine with this meal is typical. Kaffee und Kuchen means “Coffee and Cake” and it’s very similar to the British tradition of “Teatime”. It’s a custom that brings families together to enjoy a little together and “Gemütlichkeit” (coziness). Families and friends gather together in the mid-to-late afternoon to drink coffee and enjoy a slice or two of often homemade cake. Typical cakes you might find at such a gathering include Black Forest cake (Schwarzwälderkirschtorte) and bee sting cake (Bienenstich). Other favorites are cheesecake with Quark (Käsekuchen) and fruit tarts like plum or apple tarts (Zwetschenkuchen or Apfelkuchen). When people don’t have time to bake at home, they often purchase pastries from the corner Bäckerei (bakery). These purchased goods could include Mohnstückchen, a poppy seed pastry or Apfeltasche, an apple-filled pastry pocket! The cakes and pastries are, of course, almost always accompanied by a steaming hot cup of rich German coffee. This dark coffee is typically served with cream or condensed milk. However, tea has become more popular over the past decade, particularly in Ostfriesland. 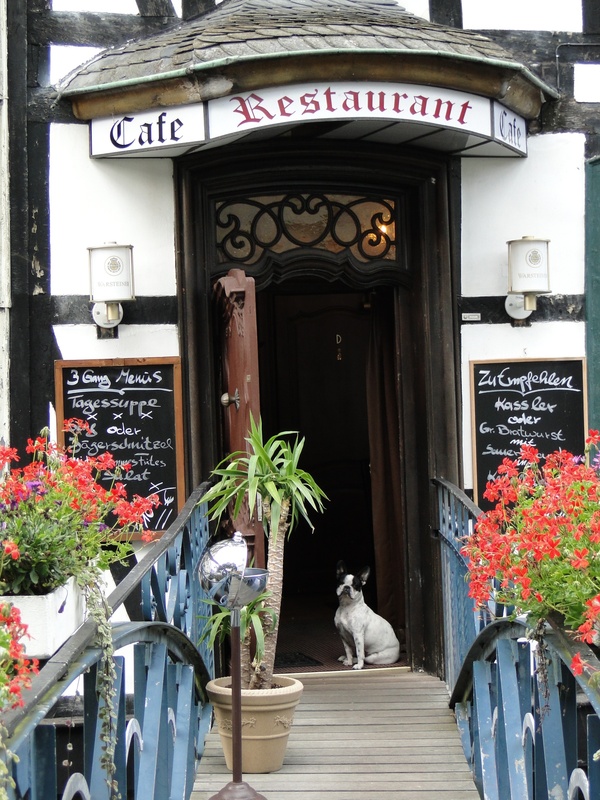 Here, it has always been traditional, and a quarter of all the tea in Germany is consumed in Ostfriesland. Just like American kids, German children also like to eat so-called fast food. And, just like in North America, this increase in consumption of fast food has led to increasing problems with obesity. According to a recent study, German children spend about 15 Euro (approximately $19) per week on fast food. About one-third of all male youths and one-sixth of all female youths eat fast food at least one a week. This is much less than American children, but it is becoming a serious problem all the same. The most typical fast food eaten in Germany is similar to that eaten in American. Namely, burgers, pizza and fries from well-known chains such as McDonald’s, Burger King and Pizza Hut. A more traditional choice is a Bratwurst served with a bread roll (Brötchen). Currywurst, a sliced sausage served with a curry-ketchup, and Pommes Frites (french fries), is always a great choice! This is then served either with mayonnaise, ketchup or even sometimes with both! This combination is called Pommes rot-weiss, referring to the red ketchup and the white mayonnaise. The sausages and fries can all be purchased from street stalls known as Würstchenbuden. One of the most common fast food meals has risen to such popularity that it outsells all US fast food chains in Germany combined. 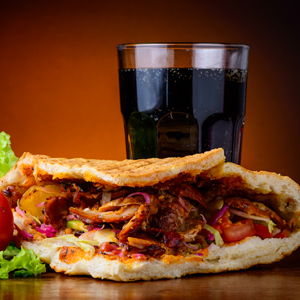 Döner Kebab was first introduced in Germany by Turkish immigrants, and now you can find Dönerbuden (kabob vendors) on virtually every street corner in large towns and cities! A Döner Kebab is made from thinly sliced meat (veal, lamb or poultry) cut from a rotating vertical roasting spit. The meat is served in a warm pita pocket or flatbread (Fladenbrot) with lettuce, onion, cucumber, tomatoes and a yogurt sauce (Joghurtsoße). In addition to differences in the type of food that is eaten, meals provide many differences in the way that people buy, serve and eat food. This means that there are also differences in the table manners Germans expect to be present! Here are some of the differences you will find if you eat at a restaurant or with a family and some tips on how to behave! Germans tend to eat less with their fingers, so use a fork to eat your fries. Both a knife and fork are used in order to eat a sit-down meal. Don not just use your knife to cut your food and then only eat with your fork. Germans do not put their hands on their lap while they eat. In fact, Germans consider it rude to put your elbows on the table! 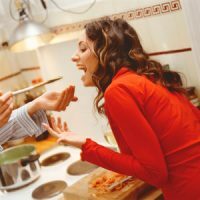 Make sure you compliment the home-cook or chef by saying “das schmeckt (gut/lecker/wunderbar)!” This means that the food tastes good/yummy/wonderful. 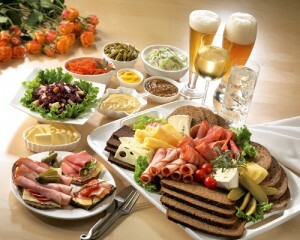 When eating or drinking together, wait until someone says “Guten Appetit” or wants to “anstossen“(say “cheers”). Don’t expect any ice cubes in your soda, you need to ask for it. There are NO free refills on drinks, and the basket of bread or pretzels on the table usually costs extra. Don’t be surprised if you are charged for what you eat! Water will not automatically be brought to your table. You have to order it, and you will be brought bottled water which you have to pay for. You will be asked if you want the water “mit oder ohne Kohlensäure” meaning still or sparkling. If you want tap water you will have to specify that you would rather have “Leitungswasser.” Note: it is not customary to serve tap water at a restaurant in Germany. When you cross your knife and fork on your plate, it means you are merely pausing. Laying your knife and fork side by side means you are finished, and the waiter may come and take your plate away. Doggie bags are relatively unknown, so your waiter/tress will be surprised if you ask to take leftovers home with you. Tips are not expected to be as generous as in the US, since German wait staff are usually paid more per hour. A general rule is to round up the bill, so if your bill is, say 22.50 Euros you might give 24.00 or 25.00 Euros. A general rule of thumb is to leave about 10%. Unlike in the US, you may find that your waiter/waitress will remain at the table while you pay. This means you need to make sure to let them know how much tip you want to leave. For example, if your bill is 15.70 Euros and you want to leave 1.30 Euros as a tip, then say “Siebzehn bitte” when handing him/her a 20 Euro note. Credit cards will be accepted in the majority of restaurants, but it is more common to pay with cash.